Both the CrimeFest event and its awards program have turned 10 years old this year, its four-day convention set this year in the West Country, in Bristol. 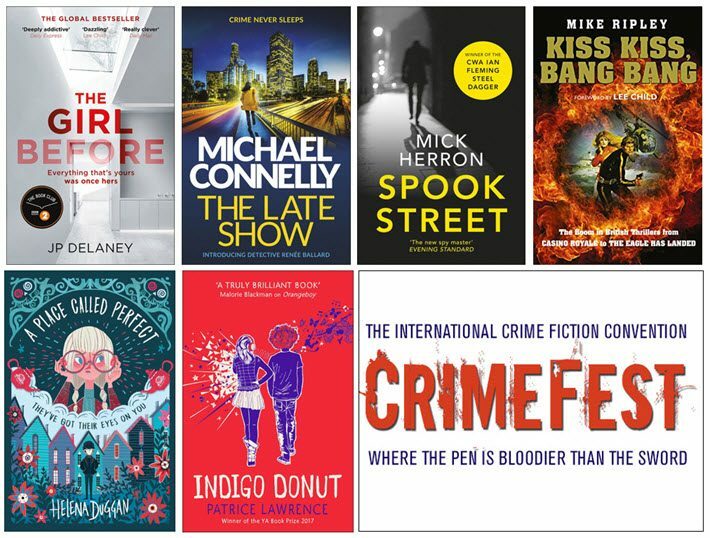 Announced on Sunday evening (May 20), the UK’s CrimeFest convention awards mark the sixth year of the annual prize program. Featured guests at this year’s conference, which was held in Bristol on May 17 to 20, included Peter James, Martina Cole, Jeffrey Deaver, Lee Child, and translated guest authors Yrsa Sigurdardóttir and Gunnar Staalesen. Below, we list each of the six categories’ shortlists, the winner in bold. Named for its sponsor, Audible UK, this award honors an unabridged crime audiobook that can be downloaded from Audible. To be eligible this year, an audiobook had to have been published in the UK in 2017, not only in audio but also in print. The winning author and audiobook narrator(s) share a £1,000 prize, each of them also receiving a Bristol Blue Glass commemorative award. Titles were submitted by publishers, and Audible UK listeners established the shortlist and the winning title. This honor is for a crime fiction ebook first published in the British Isles in both hardcover and digital formats. Titles were submitted by publishers, and a team of British crime fiction reviewers voted to establish the shortlist and the winning title. This prize honors a humorous crime novel published in the British Isles in 2017. Titles were submitted by publishers, and a team of British crime fiction reviewers voted to establish the shortlist and the winning title. The Keating is for a biographical or critical book related to crime fiction first published in the British Isles in 2017. The award is named after British crime novelist and reviewer HRF ‘Harry’ Keating (1926-2011). Titles published in 2017 in the British Isles were submitted by publishers, and reviewers of fiction for children and young adults voted to establish the shortlist and the winning title.